The last vacant lot on Ocean Drive in Miami Beach has been listed for sale, Metro 1 announced on Friday. Miami-based Metro 1 is the exclusive listing agent for the property at 304-312 Ocean Drive. The 11,500-square-foot lot is zoned for medium-high density development, offers partial ocean views and access to the beach via Ocean Drive. The site is on the market for $14 million, according to the MLS. Sea Spray Development owns the two lots. The LLC is tied to Yair Wolff, founder of Miami Beach-based W Capital Group. Wolff acquired the parcels in August 2013 for $6.3 million, according to Miami-Dade property records. 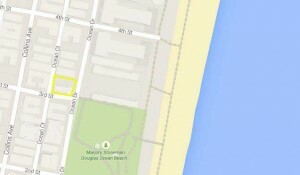 The South-of-Fifth property, which faces the newly completed 321 Ocean, includes plans for a luxury townhouse project. Revuelta Architecture designed the four 5,000-square-foot units, with plans for private rooftop terraces, luxury amenities and a smaller town house on the west side of the lot. It was once home to the Biltmore Apartments, which were built in 1937 and destroyed by Hurricane Wilma in 2005, and the Sea Spray Apartments, also built in 1937 and demolished in 2014.